One of my favorite things about the holidays growing up was making the trek back to New York every year to visit our very large, very Italian family. No matter what else was happening, my grandma would always have a plate of pizelle cookies on the table. More than any other sweet, they optimize the Christmas season for me. So this year, in her honor, I’ve desired to remake the classic cookies in a new + fresh way. 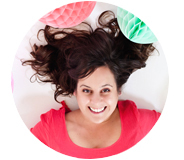 I collaborated with my favorite baker Athena and this colorful, fun, layered version emerged. Perfect for a standout holiday cake, a great present for the neighbors, or even sweet ornaments for the tree. A batch of pizelles makes A LOT of cookies – so with one recipe you could create all three ideas. Here are the directions for making a basic pizzelle (makes about 30 5″ pizzelle cookies); 3 large eggs, 3/4 cups sugar, 2 teaspoon, vanilla extract, 1/2 cup (1 stick) butter – melted and cooled, 1-3/4 cup flour, 2 teaspoons baking powder, 1/4 teaspoon salt. Melt butter and set aside. Beat eggs and sugar until light yellow, about 2 to 3 minutes. Add melted butter and vanilla. Beat until blended. Sift together the flour, baking powder, and salt. Fold the liquids into flour mix and blend until just incorporated. 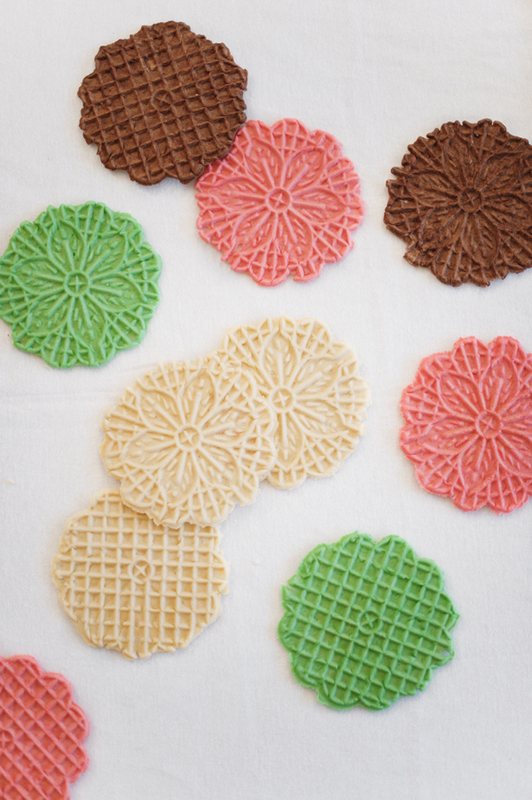 Follow the instructions on your pizzelle maker to bake the pizzelles. Make the Whipped Cream Frosting for layering the amazing cookies with: 2 cups heavy cream – chilled, 2 teaspoons vanilla extract, 1/2 cup powdered sugar. Pour the cream, vanilla, and sugar into a deep bowl, or the bowl of a stand mixer attached with the balloon whisk. Whip the cream until soft peaks form, about 10 minutes. It must be stiff enough to spread – use immediately. If frosting begins to soften, place the bowl in the freezer for a few minutes, then whip again until soft peaks form. Here are the modern and fresh variations we used. 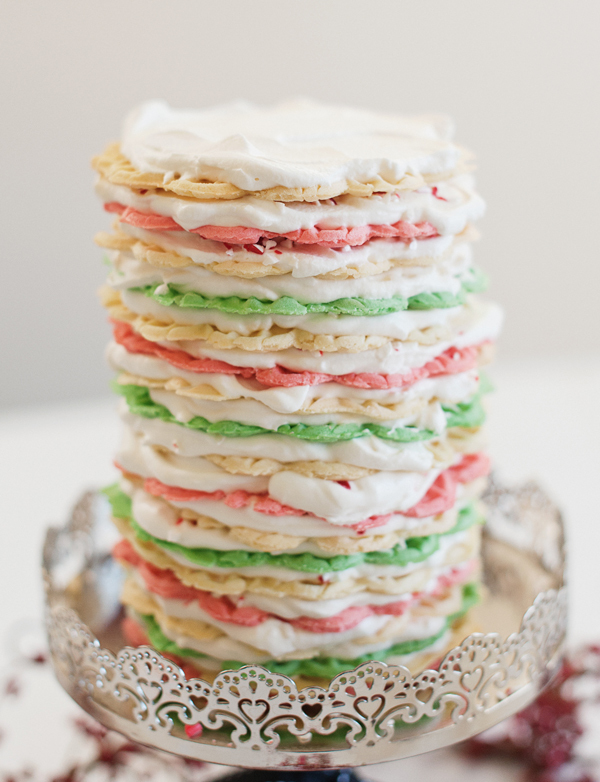 Make Colored Pizzelles by adding a few drops of food dye or gel to pizzelle batter and mix well. Add more to achieve desired shade. 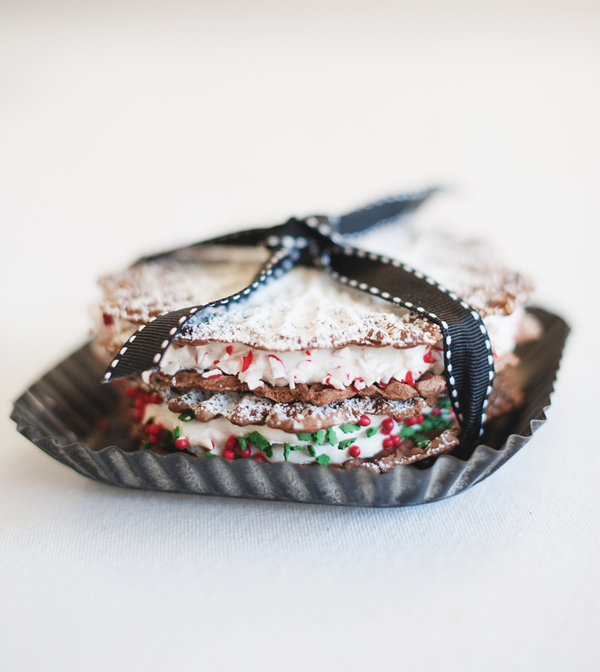 Make Chocolate Pizzelles by following the basic pizzelle recipe except omit the vanilla. Add 3 tablespoons of cocoa and 3 tablespoons of sugar. 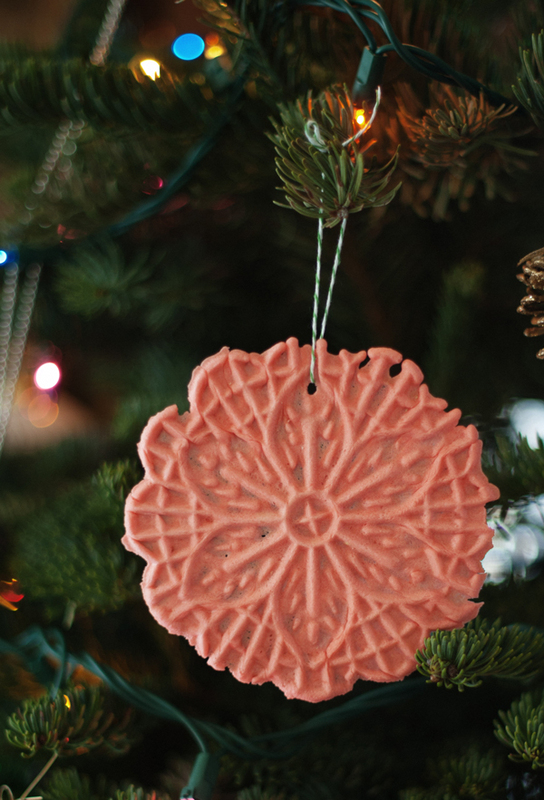 Make your pizzelles into ornaments by using the tip of a pair of scissors (or a chopstick, skewer, etc.) to make a small hole in a warm pizzelle. Thread and tie decorative twine or ribbon through the hole and tie. Hang on tree or give as a gift. 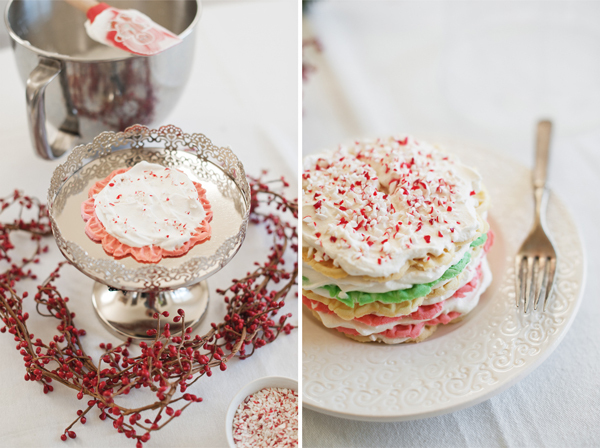 To make a layered pizzelle sandwich – Frost one side of a pizzelle cookie with whipped cream (recipe above). Top with another pizzelle. Add jimmies, peppermint snow, or other decorations to the sides (they will stick to the frosting). Dust with confectioners sugar (optional). Tie sandwich with ribbon and wrap in festive plastic to give as a gift. 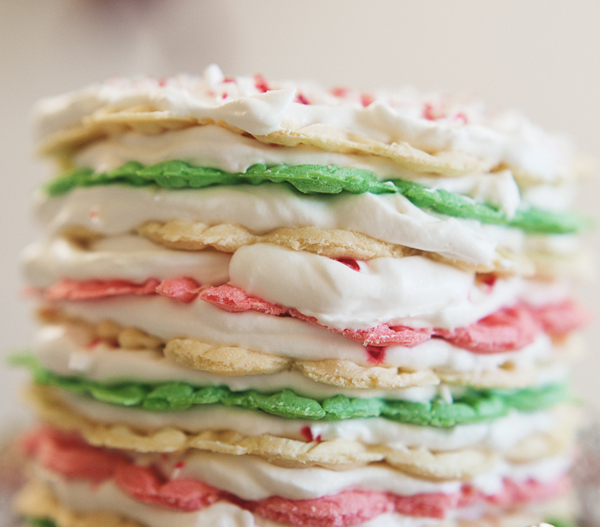 Layer the pizzelle cookies super high to make the pizelle cake! Set aside about 18-20 cooled pizzelle cookies. 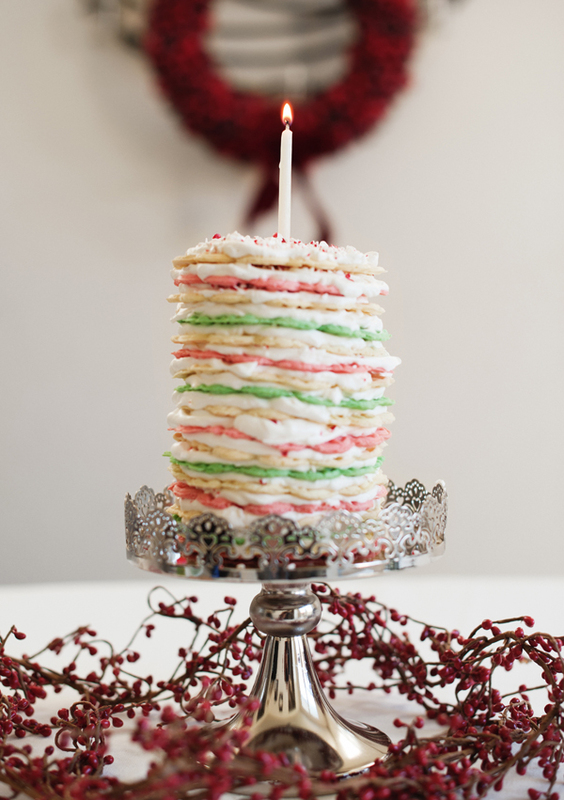 For this cake we used 9 yellow, 5 pink, and 4 green pizzelles. Lay bottom (pink) cookie on a cake plate. Frost (see whipped cream frosting recipe), then sprinkle with peppermint snow. Place yellow cookie on top and repeat with frosting and peppermint. Place green cookie next and repeat with frosting and peppermint. 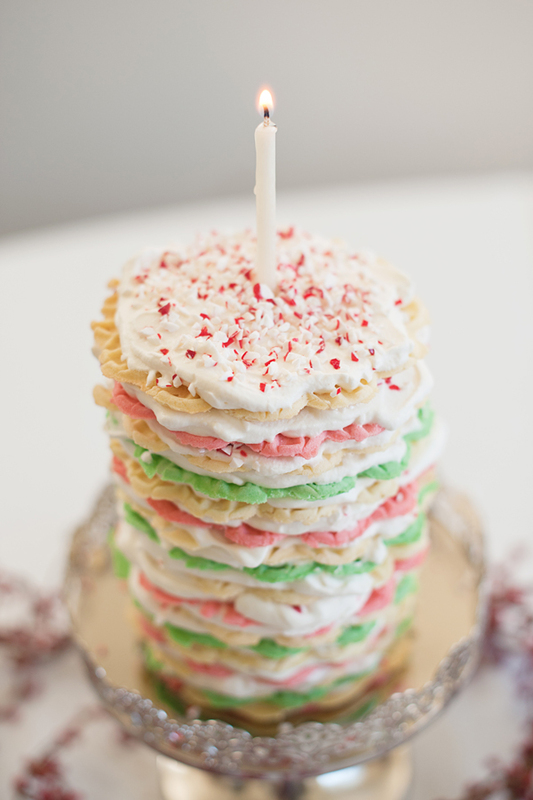 Continue this pattern as you stack the pizzelles with frosting and peppermint in between each cookie. 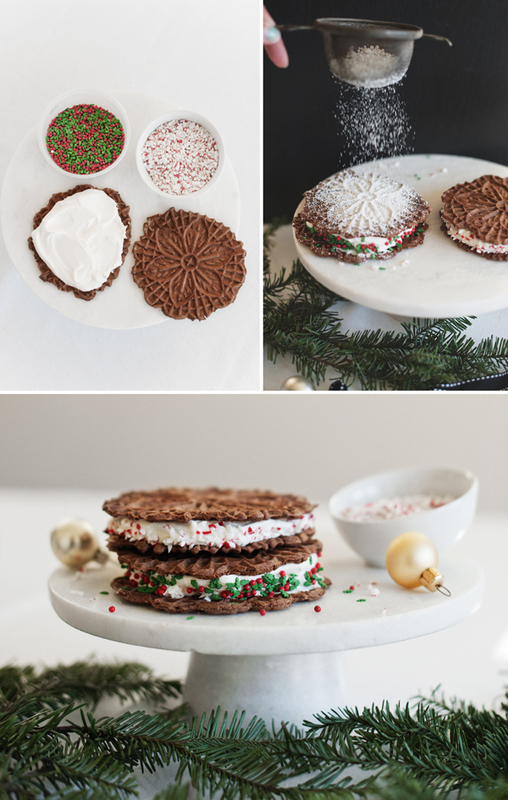 The top cookie should have a generous amount of frosting and peppermint snow. 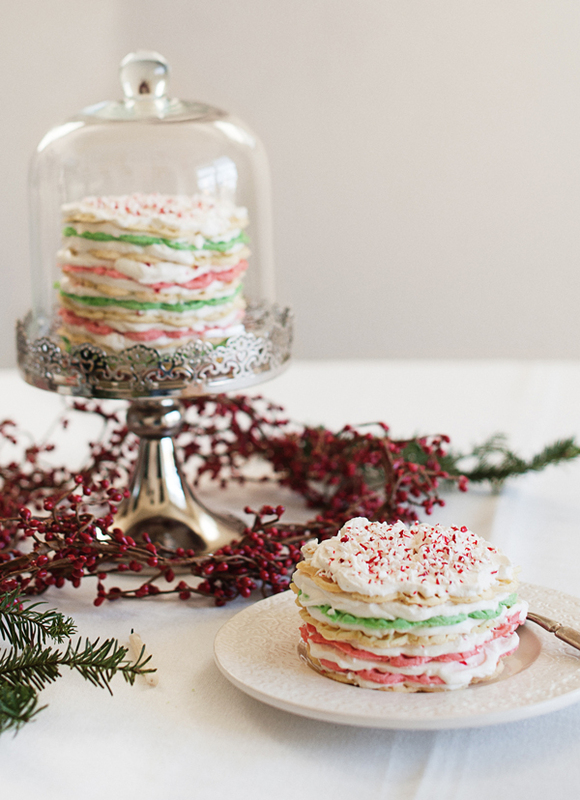 To eat, remove however many pizzelles you want from the stack and place on a plate. Enjoy! Leftovers should be kept refrigerated in a container or cake saver. The pizzelles will soften in the cake. This cake is a part of our creative cake series. Produced and photographed by Athena Plichta. Creative direction by Victoria Hudgins for A Subtle Revelry. Seriously, this is gorgeous! As well as that cake saver, beautiful! Merry Christmas!